Stand Up for Africa is an Art Residency conceived and directed by Paolo Fabiani and Rossella Del Sere, in Casentino, whose aim is to interpret, through the language of art, humanitarian emergencies, geopolitical crises and the fate of migrants. 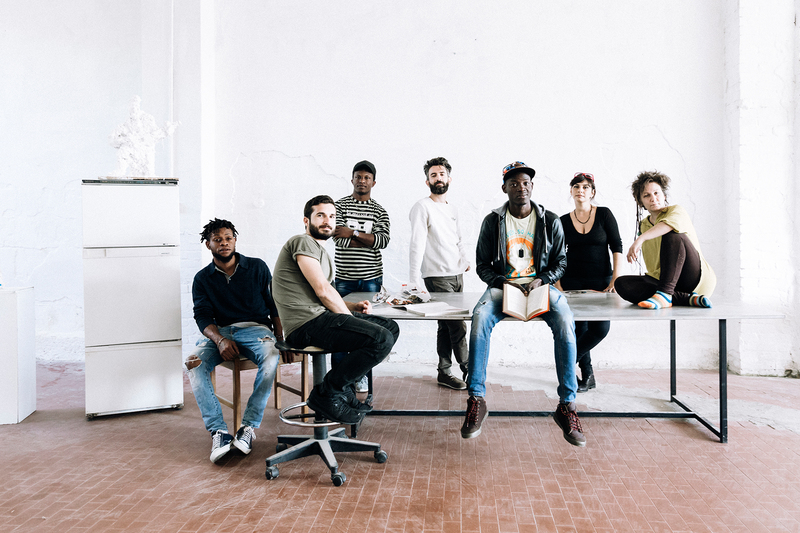 For its third edition, in the autumn of 2018 (curated by Pietro Gaglianò) three young artists based in Tuscany worked together with three young refugees from various African countries. The exhibition that concluded the residence is now hosted by SRISA. The three artists are Albien Alushaj (Fier, Albania, 1988), Marina Arienzale (Florence, 1984) and Daniela Pitré (Cagliari, 1984). These three artists worked together with twenty year old Peace Alufokhai who was born in Benin City, Nigeria, and has lived in in Italy since 2017; twenty year old Dian Foula Toure was born in Telimele, Guinea, and has lived in Italy since 2017, while twenty three year old Mouhamed Yaye Traore was born in Djugou, Benin, and has lived in Italy since 2016. During the residency the six young people have been explored and encountered landmarks in the Casentino territory of Tuscany, which is known for its enchanted nature, a tradition of deep spirituality and the grace of art. Through this experience they worked towards finding a common ground as a means to work, from which the pieces in the SRISA project space show were originally proposed. The title, Natura Naturans, refers to a interpretation of the Nature as a creative subject. According to the sensibilities of the individual, one can interpret this as something divine, as a primitive force, or as the exception to art. Here, in this dimension, in a place where one was free to explore these young people brought art into the world. Ultimately, the days and the experience of this meeting were the catalyst whereupon each person found a form to present. An exhibition successfully concluded the residence, opening at HYmno Art Lab, Pratovecchio, on September 29. This exhibition is now hosted at SRISA Project Space, as a means to present to a wider audience the experience and the works of the six young protagonists, and to promote the commitment of Stand Up for Africa. The collaboration with Santa Reparata International School of Art follows SRISA’s interest in this topic and its mission to show work that adheres to the most dynamic scenes of contemporary art; and for all those authors, artists, operators, who research and develop independent narratives. Stand Up for Africa is a project by HYmmo Art Lab, promoted by Unione dei Comuni Montani and by Rete Ecomuseale del Casentino, supported by Regione Toscana, within the program Toscanaincontemporanea 2018, by Parco Nazionale Foreste Casentinesi, Monte Falterona e Campigna, by Municipality of Pratovecchio Stia, and by Fondazione Giovanni Paolo II.